Flanged lids in all sizes. 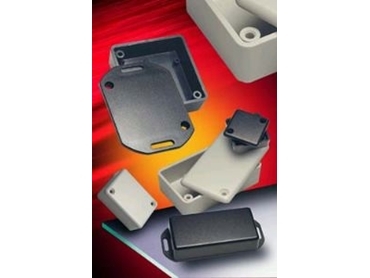 HAMMOND Electronics has extended its 1551 family of miniature general purpose ABS enclosures with the addition of shallower versions of the existing rectangular version; the introduction of new square plan sizes in two heights; and the addition of flanged lids which are now available for all plan sizes. The 96-strong family provides a strong, lightweight housing, ideal for applications such as remote controllers and other small devices. Each plan size is now available in heights of 15 and 20mm, in black or grey, with or without key ring and with a plain or flanged lid. The new square sizes are 35 x 35mm, 40 x 40mm and 50 x 50mm. Each unit is fitted with two internal mounting posts at opposing corners for direct PCB fixing. The enclosures use a lap joint construction to provide protection to IP54; the lids are fitted with two screws, reducing assembly time. The flanged lids enable the unit to be secured to a suitable surface and give an improved level of security by preventing access to the interior without demounting the enclosure.